Triple Triple Gold Slot Guide & Review - Casino Answers! 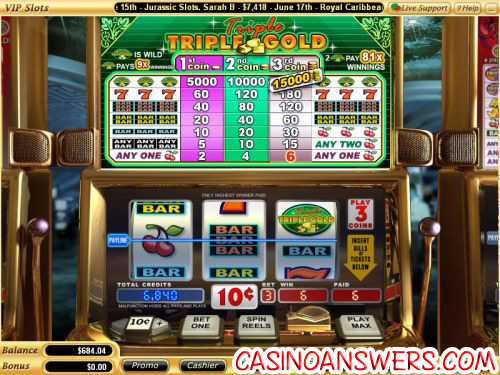 Triple Triple Gold is a 3-reel, 1-line reel slot machine developed by Vegas Tech, featuring a wild symbol and multipliers. You can play the Triple Triple Gold slot game at USA-friendly online casinos English Harbour Casino and Crazy Slots Casino. To play Triple Triple Gold, all you have to do is set your coin value at $0.10, $0.25, $0.50, $1, $5 or $10. Then, you can decide whether you want to play one, two or three coins per spin. The maximum 3-coin bet is recommended. The lowest bet you can make on the Triple Triple Gold slot machine is $0.10 with the highest being $30 per spin – quite large for a reel slot machine. Triple Triple Gold is a great high roller slot machine. Once you are ready to play Triple Triple Gold, you can play by hitting the “Play Max” (for 3 coins) or “Spin Reels” button. The top jackpot on the Triple Triple Gold slot is the Triple Triple Gold symbol. To win the gigantic 15,000 coin top jackpot on Triple Triple Gold, you must get three of these symbols on the payline. Not only is wild, meaning it will replace other symbols in a winning combination, but incredibly, it will multiply your winnings by 9X! Get two wild symbols and your winnings will be multiplied by an enormous 81X! So while you would have missed out on that 15,000X top fixed jackpot, you still could win up to 14,500 coins by using the multipliers on the symbol. Payouts on the Triple Triple Gold slot machine are (1/2/3 coin payouts in parenthesis): 1 Cherry symbol (2/4/6), 3 of any Bar symbols or 2 Cherry symbols (5/10/15), 3 Single Bar symbols or 3 Cherry symbols (10/20/30), 3 Double Bar symbols (20/40/60), 3 Triple Bar symbols (40/80/120), 3 Sevens symbols (60/120/180), 3 Triple Triple Gold symbols (5000/10,000/15,000). There are 9 winning combinations in Triple Triple Gold. To play the Triple Triple Gold slot machine and hopefully triple your winnings, head over to the US-friendly English Harbour Casino! Can players from the United States play the Triple Triple Gold slot? USA players are welcome to sign up, deposit and play for real money at all Vegas Tech casinos, including two of our favourites English Harbour Casino and Crazy Slots Casino. How do I win the top jackpot on the Triple Triple Gold slot machine? To win Triple Triple Gold’s 15,000X top jackpot, you must line up three Triple Triple Gold wild symbols on the center payline. Even if the symbol is off by an inch, it will not count. Does Triple Triple Gold have a progressive jackpot? Triple Triple Gold is not a progressive jackpot slot. However, due to the extremely high top fixed jackpot of 15,000X your coin bet, you can win up to $150,000 playing Triple Triple Gold. For Vegas Tech progressive jackpot slots, please read our Red, White and Win Progressive Jackpot Slot Review. What is the Triple Triple Gold Slot Machine game?